In Google's promotional video showcasing the improvements headed to Blogger over the course of 2011, the company asks: "Have You Looked at Blogger Lately?" Chances are the answer is "no." Even though Blogger is one of the top 10 most-visited Web sites -- leagues ahead of competitors WordPress, Tumblr, and the like -- the Blogger interface has been mostly static over the platform's 11-year history. The most significant update came last year when Google unveiled the Blogger Template Designer, but since then, the service has been quiet. Meanwhile, competing blogging platforms have matured with slick interfaces and intuitive mobile apps. Tumblr has made notable headway in this direction -- the Tumblr iOS app is streamlined in such a way to allow for specific types of posts, such as photos, quotes, and links; and has a built-in content discovery system that makes Tumblr more of a social network than a blogging tool. It's precisely this kind of eye candy and ease-of-use that Google hopes to emulate with its forthcoming updates. 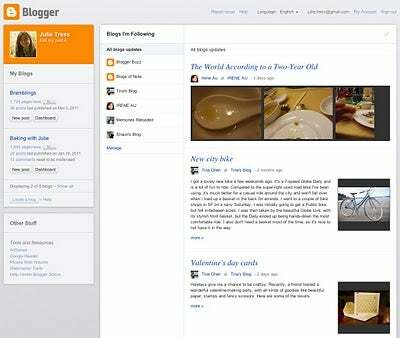 The new Blogger -- which the company says will be updated "throughout 2011" -- uses the Google Web Toolkit, a development toolkit for building and optimizing complex browser-based applications. It also sports a modern publishing dashboard and a more customizable template designer. What's exciting for the socially networked is Google's new content discovery feature. Depending on the blog you're currently reading, Blogger finds topic keywords and feature them in a drop-down menu, allowing users to quickly hop between (or stumble upon, if you will) different Web sites posting similar material. With 400 million active readers and approximately 5000 novels worth of new words per day, Blogger's update ought to reach a lot of readers and writers. What are you looking forward to most with this update? 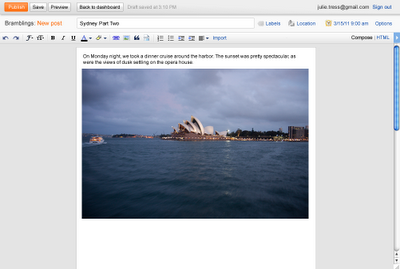 I'm psyched for a decent, Google-built Blogger app. Publishing from the Web on a smartphone is a pain.